The Middle of Somewhere by J.B. Cheaney (Knopf, 2007). Twelve year-old Veronica Sparks is on a road trip across Kansas with her grandfather (a wind prospector) and hyperactive younger brother. Her attempts to take control of her own life are thwarted by her brother’s impulsiveness and her grandfather’s threats to take them all back home. And then her brother disappears… Warm, funny, richly drawn, and satisfying. And, hey, there’s a human cannonball! Ages 8-up. Recommendation by Greg Leitich Smith. J. B. Cheaney was born sometime in the last century in Dallas, Texas. While growing up shy and day-dreamy, she read a lot but wasn’t that interested in writing. But years later, after she’d dropped out of college to get married, she found herself writing a novel. In time she wrote another, and another, and another–meanwhile raising and homeschooling two children in her spare time. Fiction writing had become habit-forming, but her first four manuscripts were never published. Then came her epiphany: Instead of writing for grownups, why not try writing for a really demanding audience? Her first novel for young people, The Playmaker, was published in 2000, followed by The True Prince (2002) and My Friend the Enemy (2005). All are published by Knopf and all are historical. Her latest, The Middle of Somewhere, is a contemporary, humorous story for middle-grade readers. We last spoke in October 2005 about My Friend The Enemy (Knopf, 2005). Could you update us on your writing life over the last two years? I’m happy to learn that some schools have incorporated my first novel, The Playmaker, into their school curriculum as an introduction to Shakespeare. Paperback sales for that book are still doing reasonably well. My Friend the Enemy was also named as one of the “year’s ten best” books for young readers by the St. Louis Post-Dispatch, and was a finalist for the PEN Center award for children’s literature. One big thrill was seeing My Friend the Enemy in the Scholastic Book Club for December! When my kids were in school we used to get those Scholastic fliers, and I daydreamed about one of my books showing up there. So I guess that’s a dream come true. 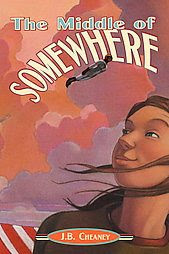 The most exciting news for me is that The Middle of Somewhere was selected for the 2008-09 master list for the Texas Bluebonnet award. As a Texan, my heart is warmed. Congratulations on the release of The Middle of Somewhere (Knopf, 2007)! What was your initial inspiration for writing this novel? I call this book a “happy convergence.” It started when I combined two story ideas–a road trip and a dysfunctional sibling–into one, making it a story of a road trip with a dysfunctional sibling. Other pieces started coming together: a newspaper article about a wind prospector that I’d clipped while working on another novel, a real human cannonball moving to a town nearby (with atendant publicity), memories of living in Kansas and a road trip with some friends to the western half of the state. Instead of an initial inspiration there were several, all coming together like the center of a spiral nebula! What was the timeline between spark and initial publication, and what were the major events along the way? In the summer of 2004, I had enough pieces together to make my primary research expedition: not only a road trip but a camping trip as well–my first! It was just a little three-day journey, but I gathered a lot of material that ended up in the story, from my first night in a tent to the young man in a pickup I met near the Gray County wind farm, who became the character of Howard. I wonder if he’ll ever know somebody put him in a book? I sent the manuscript to my editor early in 2005, and at the ALA convention in Chicago that summer I met Chip Gibson, president of the children’s division at Random House and all-around nice guy. He hinted to me that my editor was very positive about the manuscript, and later that summer we signed a contract. I was hoping for a summer 2006 release, but it was not to be. The Kansas postcards that appear in the text slowed production a little. This book presented the fewest challenges of any I’ve written, but the chief obstacle is getting a handle on the main character. When the main character is a 12-year-old girl with problems (like every 12-year-old girl), and the voice is first-person, the tendency is to produce a pre-adolescent whiner. Ronnie sounded whiny to me and I didn’t like her that much but wasn’t sure what to do about it–until I recognized her recent discovery of self-help books. Sure, she has problems, but she’s an enterprising sort of person and Kent Clark’s SEIZE THE WAY! hands her a method for “advantagizing” her life. The self-help book turns out to be as simplistic and cliched as most of that genre, but in the process of understanding that, Ronnie also learns that the challenge of life is being there for it. You’re originally from Dallas, Texas, and now based in Bolivar, Missouri. How have the settings of your life affected your writing? I’ve found a way to write about almost every place I’ve ever lived–whether or not the manuscript was ever published. The northwest was the setting for My Friend the Enemy, as well as a time-travel romance that never made it past the editor. I’ve also written a historical romance set in east Tennessee (where we lived twice) and a railroad novel inspired by our experience of living in the mountains of New Mexico, where my husband worked on a steam railroad. The Middle Of Somewhere has some significant Texas connections, because that’s where the kids’ grandfather is from. We’re pretty well settled in Missouri now, but all those places we’ve resided are still residing in me, and I wouldn’t be surprised if they find their way out in future books. If you could go back in time and talk to your beginning writer self, what advice would you give her? What a great question! And how I’d love to go back and lecture myself about good work habits! But the lecture would probably fall on deaf ears–or at least, unprepared ears. I probably came to be a writer the only way I could: by fits and starts, failure seesawing with success, brash confidence struggling with trepidation. All those unpublished manuscripts turned out to be absolutely indispensable, because each one taught me something, and we all have to learn in our own way. One thing I would tell myself is what I tell all writers: open your eyes and ears and noses and mouths and take it all in. The world is crammed full of writing fodder, and the hardest part of writing is deciding what not to write. Well. I’m not sure. My editor has a manuscript that she likes but isn’t crazy about, and I’m thinking it needs some revision, especially in that mendacious middle part. I’m also kicking around an idea based on a drawing by my son the artist. The crystal ball is very fuzzy right now.